"Made of pressed board and paper laminate finish...looks like a high-end piece of furniture without the high-end price tag." "A solid budget choice for all bedrooms...three wide shelves and a single sliding drawer...for excess sweaters, pants and linens." "Large mirrored armoire...with two major sections: one with two rows for hangers and another made up of two large shelves and two drawers." "Exceptionally stylish piece...this adorable wardrobe has a removable hanging rod, while the other contains four small drawers." "Portable wardrobe has a zippered cover so you can protect your clothing, especially if you’re storing it in a den or a garage." "An incredibly durable piece...single hanging rod, six hooks (great for purses or totes) and four heavy-duty casters with two brakes." "This totally customizable piece allows you to mix and match sections to best fit your needs." A great wardrobe is functional, affordable and complements your larger design scheme. 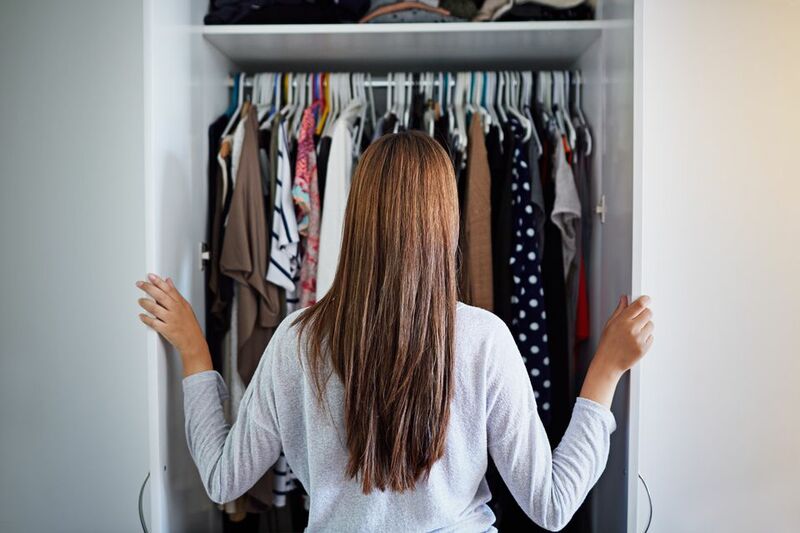 Because a standard wardrobe is always out in plain sight, you want to make sure it looks great with your bedroom decor and isn’t an eyesore. 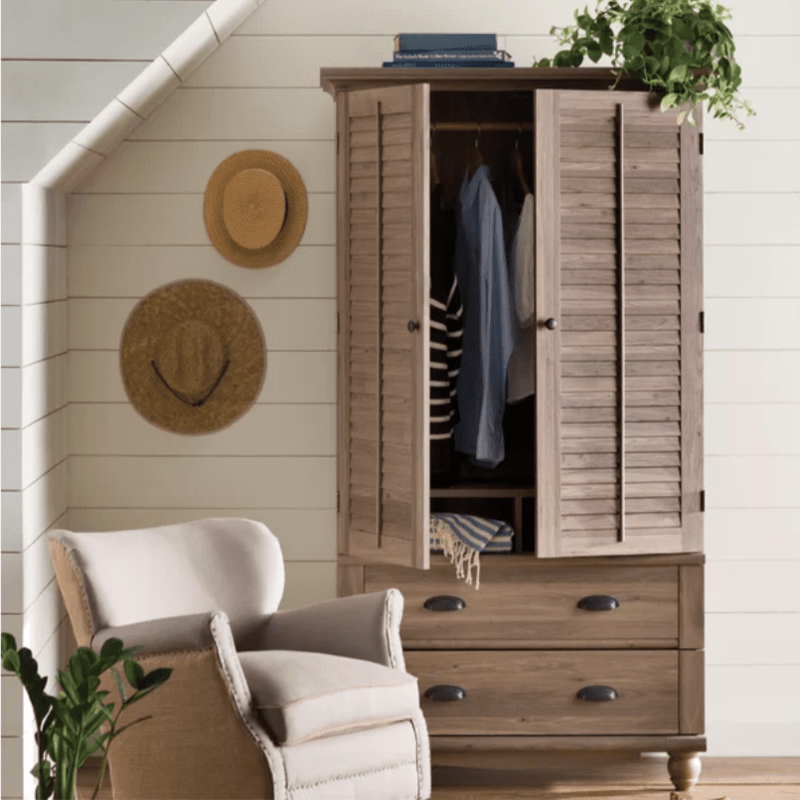 The Pinellas TV-Armoire is our pick for the best overall wardrobe because it has everything we love in a storage unit and looks beautiful in any space. The armoire measures 71.65'' by 39.37'' by 21.65'' and has one bar for hanging and two slide drawers for folded pieces or linens. There’s a shelf under the hanging bar so you can also use this wardrobe as a TV stand instead (it will hold up to 95 lbs. and widths up to 35”). Made of pressed board and paper laminate finish, the Pinellas wardrobe looks like a high-end piece of furniture without the high-end price tag. Reviewers say assembly is a breeze — though it weighs 190 lbs, so make sure you have help getting it into the bedroom. If you’re looking for a great standard wardrobe that does it all, the Pinellas is our top choice. If you’re looking for something that’s even easier on the wallet without sacrificing style or durability, the Andover Mills Revere Armoire is a solid budget choice for all bedrooms. It comes in soft white or jamocha wood and costs less than $250. The Revere Armoire is a great choice for excess sweaters, pants and linens because it doesn’t have a hanging rod (though you can easily add one). The interior contains three wide shelves and a single sliding drawer. It’s made out of manufactured wood, but reviewers say it doesn’t look cheap. It includes a five-year warranty against defects, which is a great reassurance when buying a less expensive piece. We love this armoire because it works equally well in rooms outside of your bedroom. If you want to redesign your master, move it to the dining room to hold plates or living room for board games. Reviewers say it can be assembled in less than an hour and holds up well year after year. A large mirrored wardrobe will easily turn into one of the hardest working pieces in your bedroom. The Hawkesbury Armoire is a great overall choice if you want to make your mornings a little easier and your room a little less cluttered. This large wardrobe measures 72'' by 48'' by 20'' and is segmented into two major sections: one with two rows for hangers and another made up of two large shelves and two drawers. Which is all to say, if your closet is too small or you don’t even have a closet in your room, this armoire will solve all your clothing storage needs. The exterior of the piece has a full-size mirror, so you can get dressed and ready to go without leaving your bedroom. It comes in espresso, mahogany and gray colors, and weighs just over 180 pounds. Reviewers note that assembly is a little difficult, but for the price and size of this piece, the payoff is worth it. If you’re looking for an exceptionally stylish piece, the West Elm Mid-Century Wardrobe was made with you in mind. While it’s a little harder on the wallet, this piece is built to last and looks fabulous to boot. Channeling the “Mad Men” aesthetic, this chifferobe is slightly smaller than some of the others on our list, coming in at 40" by 22" by 54.5". The real wood acorn finish is a neutral choice, perfect for any bedroom. One side of this adorable wardrobe has a removable hanging rod, while the other contains four small drawers for intimates or other foldables. There’s a large 40” drawer on the bottom to give you infinite storage possibilities. This West Elm piece is a perfect choice for someone who needs storage space and wants to add a bit of “wow” factor to their bedroom. Whether you’re living in a temporary space or you want to add extra storage to a garage or basement, a portable wardrobe is a great choice. We love the Songmics Portable Wardrobe because it’s affordable, but will hold up over time. Made from waterproof fabric and steal and plastic tubing, this portable wardrobe is 43.25” by 17.75” by 68”. It has a zippered cover so you can protect your clothing, especially if you’re storing it in a den or a garage. It has five shelves and a hanging rod to accommodate all of your overflow. It weighs under 10 lbs, but can hold up to 70 lbs of stuff. Reviewers say it’s the perfect choice for short-term storage, noting that it may bend over time if it’s overloaded. Who says a wardrobe has to have doors? Clothing racks are a great choice for walk-in closets or urban spaces. The Container Store Industrial Pipe Clothes Rack is an incredibly durable piece that allows you to show off that expensive dress you spent just a little too much on. Made of pure steel, this piece is 36.5" by 19" by 64" and looks like it came straight from a New York City loft. It has a single hanging rod, six hooks (great for purses or totes) and four heavy-duty casters with two brakes. The bottom can hold shoes and other knick knacks. It can hold up to a whopping 200 lbs of clothing, so you don’t have to worry about this piece falling apart under heavy wool coats or big bags. A piped clothing rack is a wonderful choice for those of us with a wardrobe itching to be shown off. Reviewers say it’s incredibly easy to assemble and doesn’t buckle under excess weight. Ask any organized person and they’ll tell you: the IKEA Pax Wardrobe is a must-have piece for anyone who wants to take their storage to the next level. This totally customizable piece allows you to mix and match sections to best fit your needs. You can install it inside a closet or against a wall; either way, you will never want for storage again. This ready-made version is 78.75” by 23” by 79.25” and is available with or without doors. Constructed with particle board, plastic and polypropylene, you can add extra drawers and shelves to this piece with the Komplement series, also from IKEA. If you live in an old home or apartment, this piece also compensates for unevenness in your floorboards with easily adjustable feet. If you’re looking to customize a piece entirely to your needs and liking, the Pax is a wardrobe that never fails to disappoint.